Ashley has lots of unique ways to use the Banners.com product line into her wedding planning. Her first project was to ask her bridesmaids to be in her wedding. 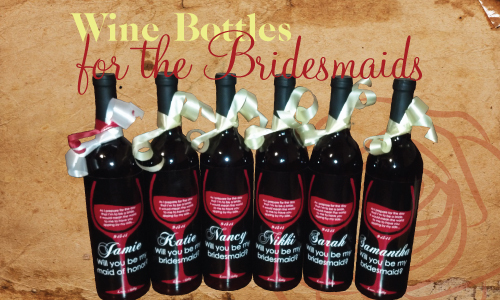 Ashley asked each of her bridesmaids using a unique wine bottle that was decorated with vinyl decals. The wine bottles say "As I prepare for the day that I'm to be a bride, it would mean the world to me to have you sipping by my side..." with the wedding date followed by "Will You be my bridesmaid?" The labels were printed on a Calendered Vinyl with Lamination decal material. If you would like help creating your own wine bottles, please contact a customer service representative for help (service@banners.com or 320-965-9300), or visit our vinyl decals page.